Each year, the world's population continues to grow. That means farmers will need to produce more and more food to meet the demand. In order to adapt to the future demands, modern farmers are beginning to adapt to precision farming. This allows for an increase in yields, reduces waste, and limits the economic and security risks that come with agricultural uncertainty. In the past, farming has relied on managing entire fields with the same method. Farmers would make decisions on planning, harvesting, irrigating, and applying fertilizers based on historical data and regional conditions. Precision farming is changing the way farmers do things. It combines factors such as sensors, GPS, mapping tools, and data analytics software to allow the farmer to customize plant care without increasing labor. Farmers are able to get feedback in real time and make decisions about water, pesticides, and fertilizers based on individual areas requirements. 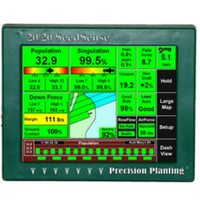 Precision planting assists farmers in knowing when to plant and harvest crops. So what else is so special about precision farming? It improves time management, reduces water and chemical use, and produces healthier crops and higher yields. Farmers are able to conserve resources and reduce chemical runoff. Farmers can now treat their large fields as if they are groups of small fields. Precision farming is changing the farming industry. Farmers can reduce potential missteps and maximize their yield. Imagine what the farming industry will be like years from now. At West Enterprises, we work with producers to maximize the use of precision farming by providing complete or complementary products from the leading Precision Agriculture hardware companies, including Ag Leader, Precision Planting, Soil-Max, and others. Our goal is to maximize your return on investment. West Enterprises can also offer you precision tools to help with all of your farming needs. Contact West Enterprises today to learn more about precision farming!